The Ryobi 5.5 kVa generator is one of the most popular generators in South Africa. Prices range between R7,999 and R9,299. But most generators have sold out as stage 4 load shedding continues. 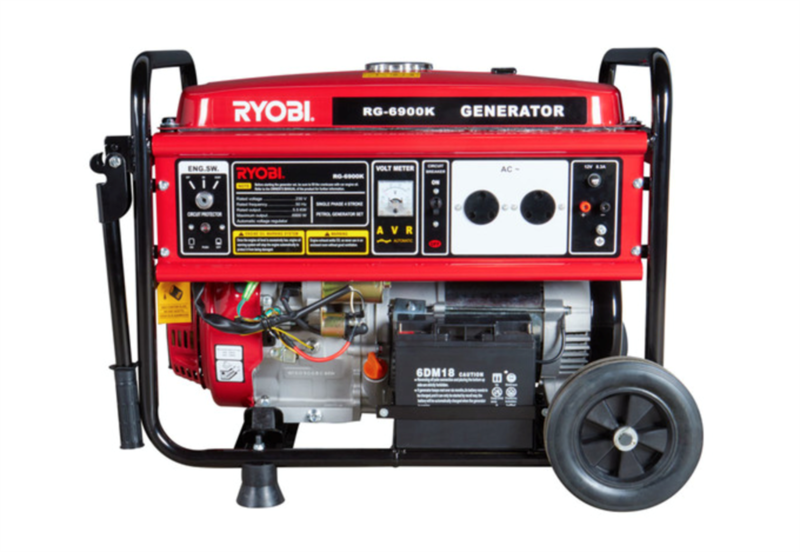 The Japenese-made Ryobi 5.5 kVA generator, which provides up to 6,900 watts of electricity, is one of the most popularly sold generators in South Africa right now, most South African hardware stores agree. But generators have mostly sold out at hardware stores as South Africans rush to make plans to deal with ongoing stage 4 load shedding. Vusi Sololo, a buyer at Build it, Cape Town City Bowl, said the Ryobi 5.5 kVA is strong enough to power most household appliances such as a fridge and television and has a Honda-made engine making it pretty reliable. It comes with a fitted automated voltage regulator to protect appliances from voltage fluctuations, and a battery for keyed start. If you can find one in stock, the Ryobi 5.5 kVA costs R7,999 at Build It, R9,299 at Brights Hardware, R9,000 at Builders Warehouse, R8,999 at Makro, and R8,700 Buco. Vincent Le Roux, from Brights Hardware in Blackheath, said they’ve sold 42 generators since last Thursday when stage 4 load shedding was first implemented. He suggests people consider their needs before investing in a generator. Alfie Pereira from Buco said a generator supplier told them that they’ve sold 600 generators across South Africa in a 24-hour period. “We have completely sold out on Ryobi generators, and are expecting the next shipment only in the first week of April,” Pereira told Business Insider South Africa. He said other generators consumers might consider include Hyundai and Yamaha, but stocks vary from store to store.